I need help on programming the Nexys 3 using a USB memory stick. 1. Save a single .bit file to a USB memory stick. I have tried my own .bit files as well as the Digilent's Built-In Self Test. I have also tried two USB flash drives. 2. Connect two jumpers on the mode switches. I have also tried none and mode 0 only. 3. I then attached the USB flash drive to the Nexys 3 and press the reset button. But unfortunately the bit file does not get programmed to the FPGA. The <busy> LED beside the USB port on the Nexys 3 is forever blinking at a slow rate. Does anyone tried configuring the Nexys 3 using a USB flash drive? Note: I tried it on another Nexys 3 board but also fails to load the bit file. Is the USB stick formatted with FAT32? Hello Hamster, thanks for the fast response. The flash drives I used is FAT32. I even formatted it to default to be sure. But it still did not programmed the Nexys 3. Files transferred from a USB stick use the .bit file type. The FPGA can be programmed from a memory stick attached to the USB-HID port if the stick contains a single .bit configuration file in the root directory, the J8 Programming Mode jumper is set to JTAG (both jumpers loaded), and board power is cycled. The FPGA will automatically reject any .bit files that are not built for the proper FPGA. Please attach a screen shot of the root directory. Have you programmed the .bit file through the Micro-AB USB Connector using Adept or ISE? Sorry I forgot to mentioned that I tried multiple bit files which I tested to be working using Adept to programmed the Nexys 3. I also tried the verification bit file which is specifically for the Nexys 3 board found here, https://reference.digilentinc.com/reference/programmable-logic/nexys-3/start?redirect=1. Only a single bit file is stored on the flash drive that is why in my screen shot above the occupied space is only 460kb. Have you tried using a different USB memory stick? I have tried at least 3 USB flash drives. I have reached out to my co-workers to get some input into your issue. The microcontroller firmware that reads the bitfile is pretty simple... Maybe try renaming the filename so that it only contains one "." I tried renaming it to demo.bit but it still did not load. Jon, can you provide Nico with a bitfile that works on the nexys 3 you are using? I just want to be very certain this is not caused by some bitgen settings (e.g. compression). Nico, this could be a compatibility issue with the thumbdrives you are using. Can you please provide information on the drives you are using? Links to them on Amazon would be useful. Another possibility is that this is caused by excess power draw. How are you powering the Nexys 3? If you are using a thumbdrive, I recommend using an external 5V wallwort power supply, not USB power. If you don't have a 5 V power supply, you could try powering from a USB wall brick, like the ones that commonly ship with phones. Those are capable of providing more current than your standard USB connector on your computer. I have attached the bit file I am using. It is the same .bit file from the Board Verification zip file on the resource page you linked to earlier. I removed the cclk part of the file name. I have a 5v external wallwort power supply with JP1 set to wal. I have both jumpers loaded on J8 and JP8 set to 3v3. I have attached two pictures with the board programmed from the usb thumb drive, one with the usb attached. Sorry all, didn't realize Jon was testing with the same bitfile already. You don't need to retest with that file again. Next steps are to investigate the power source as I mentioned above and the USB thumb drive models. The Nexys3 came with an older version of the firmware that did not support flash drives announcing high power requirement. Please try with an older pen drive, one that does not require more than 100mA of current. 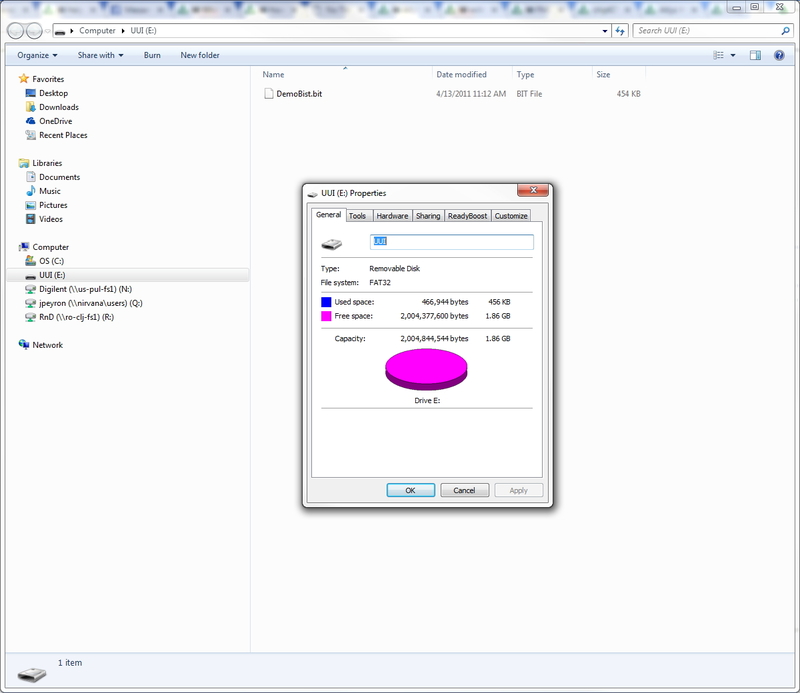 Device Manager in Windows 7 shows this info for the root hub the pen drive is connected to. There is an update for the Nexys3 firmware, but it needs to be loaded from an already working pen drive. This update should extend the range of supported pen drives. I will send the update in a PM. So sorry for the late reply. I just got back from a long vacation. I don't have have then other one right now so I cannot give the part number or link of that. I then tried loading the files given by @elodg and amazingly the first drive that does not work has now work! Soon if I get hold of other flash drives I will test it. But I am already happy now so I think this issue is now closed. Thank you so much for the support. Kudos to all of you from Digilent and everyone who respond to this post. Hi everybody, I'm new to this forum... and to the nexys as well. I'm having the same trouble as describe in this entry and even though it's been a year since the posting I did see the issue was fixed by upgrading the nexys 3 firmware. Would you mind sharing the files used to get it done? It's temporal until my new ordered JTAG programmer gets home. I have sent the update in a PM. Thank you so much. I'll test it right now.